British Literature Broad Notes Essay Essays Critical Analysis of Francis Bacon's Essay, "Of Friendship"
Critical Analysis of Francis Bacon's Essay, "Of Friendship"
As a pragmatic and as an empirical thinker Bacon followed two fundamental Renaissance principles—Sepantia or search for knowledge and Eloquentia, the art of rhetoric. This explains, to some extent, the impassioned presentation of his ideas and views and the aphoristic style of his writing. But the essay Of Friendship is stylistically somewhat different in that it contains passionate and flattering statements along with profuse analogies and examples in support of his arguments perhaps because this essay was occasioned by the request of his friend Toby Matthew. Bacon’s logic is that those who live in society should enjoy the bliss of friendship for more than one reason. First of all, friendship is necessary for maintaining good mental health by controlling and regulating the passions of the mind. In other words, Bacon here speaks of the therapeutic use of friendship though which one can lighten the heart by revealing the pent-up feelings and emotions: sorrows, joys, fears, hopes, suspicions, advice and the like. Also read Line by Line Explanation of Bacon's "Of Friendship"
Then in order to justify the value of friendship, Bacon points out the practice of friendship on the highest social level. He informs us that the kings and princes, in order to make friends, would raise some persons who would be fit for friendship. Then Bacon tries to glorify friendship by translating the Roman term for friendship, Participes curarum, which means ‘sharers of their cares’. He gives instances of raising of men as friends from the Roman history: Sylla and Pompey the Great, Julius Caesar and Antonius, Augustus and Agrippa, Tiberius Caesar and Sejanus, Septimius Severus and Plautianus. Bacon also refers to what Comineus wrote of Duke Charles the Hardy’s deterioration of his mental faculty just because of his reserve and loneliness and extends his judgement to the case of Comineus’ second master, Louis XI. The point which Bacon strongly wants to assert is that friendship functions for a man in a double yet paradoxically contrary manner: “...it redoubleth joys, and cutteth griefs in halfs”. The second fruit of friendship, according to Bacon, is beneficial for the clarity of understanding. If a man has got a faithful friend, he can be consulted to clarify the confusions of the mind. He calls the counsel of a friend, citing Heraclitus, “drier and purer” than that a man gives himself out of self -love, which clouds his judgement. Bacon then counsel of this sort into two kinds: “the one concerning manners and the other concerning business.” A friend’s constructive criticism of the other friend’s behaviour helps him more than a book of morality. In the matter of conducting practical business, Bacon thinks, a true friend’s advice can also be helpful in undertaking a venture or averting a danger. 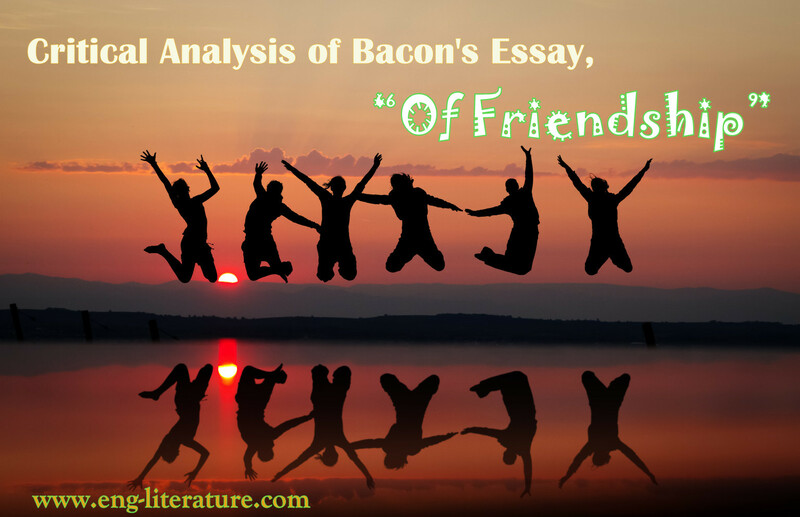 Finally, Bacon speaks of the last fruit of friendship, which is manifold in the sense that there are so many things in life, which can be fulfilled only with the help of a friend. In fact, at a rare moment Bacon gets emotional and quotes classical maxim that “a friend is another self”. His point is that a man may have many a desire, which may not be realised in his life-time, but if he has got a true friend, his unfulfilled desire will be taken care of by his friend. Not only this, a friend, unlike the near and dear ones and enemies, can talk to him on equal terms whenever situation demands. Keeping all these things, Bacon concludes that if a man does not have a friend, he may well leave this world. That is to say, he is not fit for the human society to live in.